Trendy Elastic Fabric Ponytail Holders Handmade with Fold Over Elastic. Our hair ties are perfectly stretchy! Can also be worn as a bracelet! Perfect gift idea. Perfect end of season gift for sports teams/cheer squads! Hair Tie Favors are such a fun addition to any party! They work for all hair types! 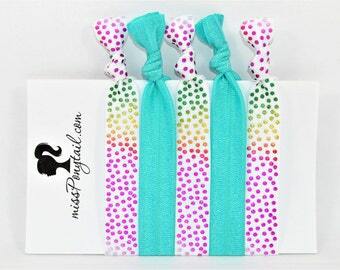 Add a pack of hair ties to any girl gift! *You may request any color to replace the blue in this set. Just add to message when ordering. Each hair tie set comes on white display card, packaged in a cellophane bag. Ready for gift-giving! These hair ties are the best. Not only are they pretty but they work great. I have long thick hair & these are the only ties that work for my hair. They hold my pony tail in place & they don't break. Excellent customer service & fast shipping.